Conflict over Starbucks coffee cup design. Ellen Degeneres sounds off about the cup. "We invite you to listen to your desires and to renew your hope. To see the world not as it is, but as it could be. Go ahead. Wish. It makes the holidays the holidays." "Apparently, for many people, the switch-up from white cups to red cups is a Christmas tradition, an indication the holiday season is upon us, but preserving the spirit of the season doesn’t seem to be on the company’s radar, although appeasing the PC Police and making sure no one’s delicate feelings are hurt certainly is. "... usher in the holidays with a purity of design that welcomes all of our stories." "We’re embracing the simplicity and the quietness of it. It’s [a] more open way to usher in the holiday." "... subliminally, ... [their customers are] being told/reminded that this time of the year is no longer about Christmas. It’s about the colour red, or something. It’s a 'holiday season.' Don’t say Merry Christmas. It’s offensive. "jo" posted: "You people seriously need to get a life. This is ridiculous. It's a coffee cup! Christian iconography has never been on one of these cups, ever! Snowflakes and stars aren't Christian icons. Get a grip people. There.Is.No.War.On.Christmas." Donald Trump (R), presidential hopeful for 2016, was not impressed with the cup. He has promised to terminate the lease of the Starbucks store in Trump Towers, his New York City hotel. Some would regard this as a threat. She broadcast a skit on The Ellen DeGeneres Show about the Starbucks cup. She called it "CupGate2015." It was posted to You Tube on 2015-NOV-10 where it received over 2.2 million views and captured over 22,000 likes vs. 820 dislikes within 2 days. That is a ratio of about 27 likes to every dislike. It was also posted it to Facebook where it received just under 30 million views during the same interval! With luck, this skit might cause an armistice in the War on Christmas, and perhaps even a permanent suspension of hostilties. A Google search for: cupgate 2015 site:youtube.com produced 44 hits. 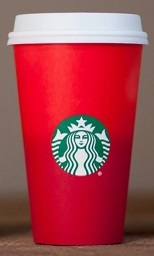 Starbucks coffee cup and alternatives to the War on Christmas.